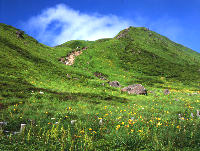 The highest mountain in Akita pref. A collective name for peaks including Onamedake, Odake, and Medake. Along with Nyutosan, it is a beautiful mountain located in the southern end of Towada-Hachimantai National Park. Besides the beautiful view, it is said to be the best site in Northern Japan for alpine plants, with several hundreds of species. The summit commands a wide view across the magnificent mountains of Chokaisan and Iwatesan, and the lazuline beauty of Tazawako lake.